This project by Studio Saxe elegantly combines modern methods of construction with local materials and techniques. 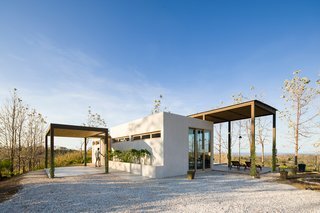 Villa Saxo is defined by an exoskeleton pergola structure that provides shade over large terraced areas while also creating a frame for the local flora to grow around. From the architect: "The architectural strategies give way to a simple relationship between the inhabitants and the natural world that surrounds them. Views are framed, shadows explored, and the movement of wind and colors create a soft palette of authentic experiences that shape and create an acute awareness of the natural in the inhabitants." RF Residence takes inspiration from the work of Donald Judd, says JSa Arquitectura. An expansive patio allows residents to soak in the views while dining alfresco. 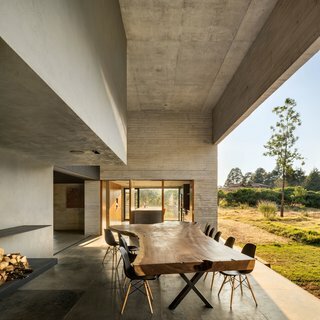 From the architect: "During its design, we favored the integration of humble, yet commanding materials such as wood and raw concrete—thought of as an expression of liquid rock—to present a series of permeable and floating monoliths, that resemble preexisting natural objects in their context." 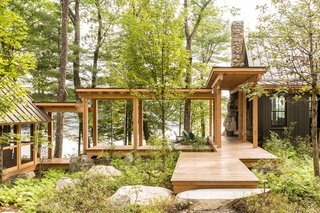 When designing Camp on Long Lake, Winkelman Architecture was inspired by the oak grove the home is nestled into. A covered walkway with views of the lake lightly tethers the kitchen, living room, and dining area to the bedroom. From the architect: "The entry to the house cantilevers to respect tree roots, and the house’s footprint shifts and dances between the trees. In this house inspired by openness and connectivity, soft angles carve out cozy places to sit, read, listen to waves against the shoreline, and gather together as a family. The house’s materiality and character connect it to the place in which it is built and the family that loves to spend the summer playing in Maine. This home is inspired by its site, a love for beauty in design, and a family’s embrace of their summers surrounded by cedar shakes and old oaks." The dark facade that covers Das Schwarze Haus has been preserved through carbonization, instead of through chemical treatment. Buero Wagner's design sits quietly in the countryside, a slender volume rising out of the trees. From the architect: "Rural areas in Germany are often characterized by urban sprawl, faceless villages, and generic detached houses. This is especially the case for the eastern shore of Lake Ammersee, which lies inside Munich's metropolitan region. 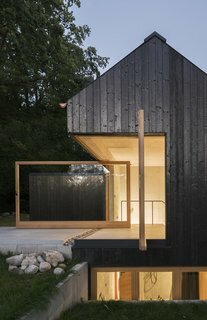 A contrast is formed by a small black house that stands out from its surroundings solely on account of its carbonized facade. Unlike typical detached homes, it is located between two existing houses, an office building, and a multifamily home. And although it directly adjoins the latter, it consciously distinguishes itself from its setting, so that it is perceived as an independent building. In this manner, a further element is added to the existing heterogeneous ensemble." Olson Kundig's response to tight site logistics was simple: Peel away the walls of the main gathering space to create an expansive indoor/outdoor living area with spectacular views. A hand-cranked wheel connected to a set of gears and chains (like those of a bicycle) allows the nine-foot-tall glass walls—the largest of which is 20 feet long—to move effortlessly. When open, the window walls of Pole Pass Cabin unite the living and kitchen areas with the expansive deck, which is nearly the same size as the building footprint. 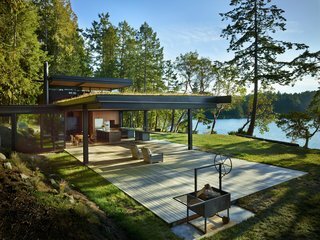 From the architect: "Nestled into a dense, wooded shoreline site, this intimate retreat serves as a gathering space for friends and family throughout the year, but takes particular advantage of the temperate Pacific Northwest summers. Located near the main house on a site accessed by boat, Pole Pass is situated to hug the dense woods while directing views out over the meadow and nearby harbor to the Salish Sea."